I love the idea of a handmade home – little bits of handmade craftiness here and there. To me it says cozy and soft, love and happiness, and it adds something unique and personal to a home that cannot be found anywhere else. Of course some of my larger projects, like my Garden Patch Granny Afghan and my Granny Cushion have accomplished this, adding a very personal and homespun look to my home, but lately I have added a few more small handmade touches. 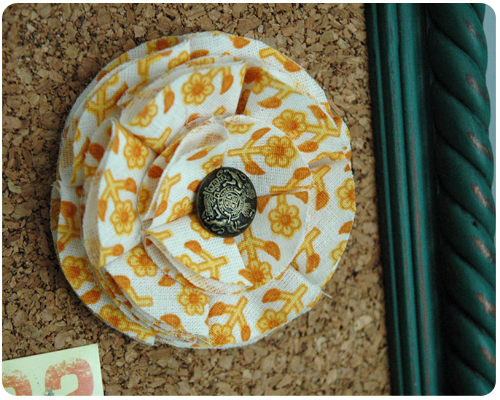 This layered fabric flower is attached to the little cork board I have sitting on the dresser in my kitchen. It doesn't do anything but look pretty, but that is enough for me. 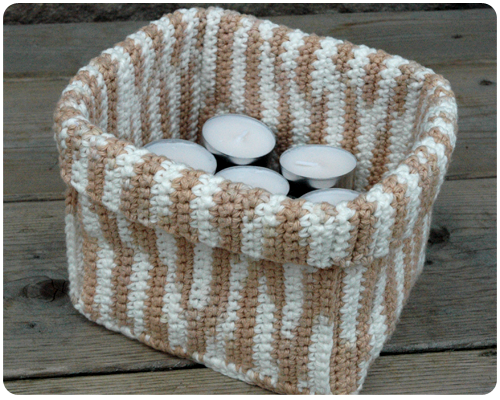 I made another crochet basket, this time to hold all the tea light candles in the bathroom cupboard. A plastic bag or container would have worked just as well, but I think this looks much prettier. 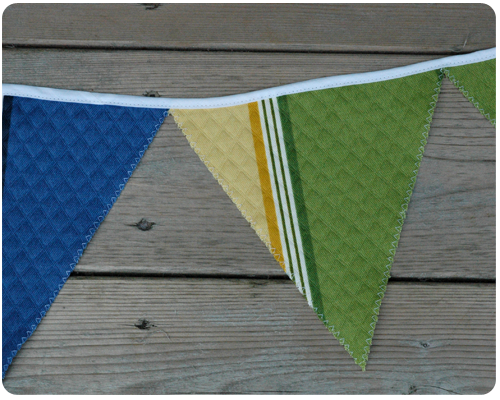 And with some leftover fabric from making pillows for the patio, I made this bunting. Once the weather turns and stays warm, I am going to hang this either in the tree or along the fence in the backyard to bring a little craftiness outside. I am excited to see how it looks. What craftiness have you added to your home lately? Hi Rachel I love the flower and the basket you made. Do you have the pattern for the basket that you used? I would love to make it. Thanks. I just made a square basket rather than a rectangle. If you follow this link you will need to register on the Yarnspirations website to access the pattern, which I recommend because it is full of great free patterns. Happy Crocheting!! !